Belfast Giants overcame the Steelers in Saturday night's Elite League title clash at the Odyssey Arena. The Giants scored the only goal of the first period when a melee in front of goal culminated in Mark Garside nudging the puck into the net. The hosts had the best possible start to the second period when captain Adam Keefe scored from close range. Daryl Lloyd made it 3-0 midway through the third period before Tylor Michel's late consolation for Sheffield. Before play started, Giants general manager Todd Kelman addressed a packed Odyssey and thanked the fans for their support during a troubling fortnight for the club off the ice. It was a reference to the mass resignation of the team from owner Chris Knight and the Giants' re-emergence under the ownership of the Odyssey Trust. He said the team would now emerge "in the strongest possible position" and paid tribute to both the players for their stance and to the new owners. Sheffield , who came into the game hard off the back of a 4-2 loss to leaders Nottingham 24 hours earlier, responded to Garside's opener and Giants net minder Garrett Zemlak was required to fend off a total of 12 shots from the Steelers in the opening 20 minutes. Keefe's goal gave the champions a two-goal cushion going into the third period. The visitors' Simon Ferguson took a four-minute penalty for boarding and roughing and in his absence the Giants scored their third, Lloyd breaking through and converting a one-on-one. Sheffield scored a fine goal before the end when Michel fired home with a rasping shot but the Giants were comfortable winners. 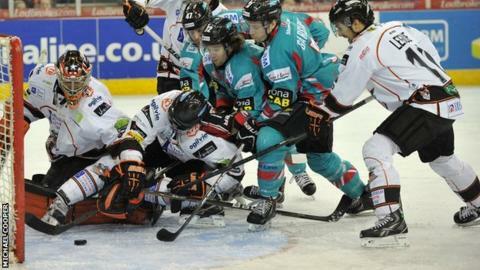 The Giants are back in action Sunday with an away game against Cardiff Devils.